Last month I had the good fortune to play my favorite Pattaya golf course, Laem Chabang International Country Club. To my great surprise the Mountain Course, usually considered the best Laem Chabang golf course, and was closed for renovations, so we played the Lake Course and the Valley Course instead. About half way through the Lake nine I noticed something strange around the greens. The fringe areas seem to be brighter color than the fairways and greens. Upon closer inspection I realized that the fringes had new Paspalum sod on them. Checking around some more the caddies confirmed this as well as went over the entire maintenance program of Laem Chabang International Country Club. 1. Valley Course: All 9 holes completed with Paspalum grass fairways, tee, boxes, and fringe areas. New white golf sand in greenside bunkers. 2. Lake Course: All 9 holes have new Paspalum tee-boxes. Hole 9 completed with new grass and sand. Other holes to follow, but schedule unknown. 3. Mountain Course: Closed for 2-3 months for grassing of tee-boxes, and fringe areas. New concrete cart path being installed to eliminate high bank areas and tendency for carts to fall-over. Overall I was impressed by the maintenance, conditioning, and money being spent to renovate this Jack Nicklaus favorite golf course in Pattaya. My only worry is the owner may want to get a larger piece of the premium golf in Pattaya, and this raise green fees for this years high season. Play Laem Chabang now and you can still take advantage of old pricing or better yet, Tuesday sport days. The conditions are excellent, some of the new turf renovation work complete and the staff as friendly and helpful as ever. 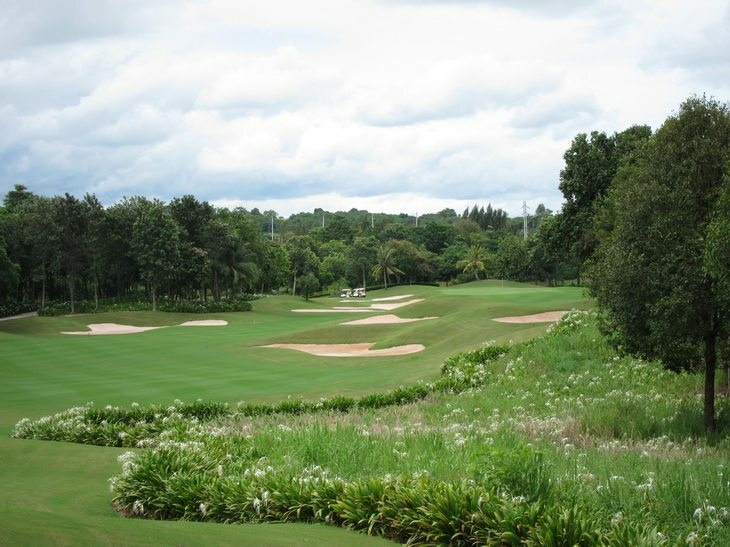 For those planning a Pattaya golf holiday this fall, keep Laem Chabang on your must-play Pattaya golf list. We’ve pre-paid green fees at the old rates to protect our Pattaya golf visitors for through the end of 2011!! !